A few weeks ago, Scott Becker, APHL’s executive director, and I visited the Louisiana public health lab outside of New Orleans and had a very interesting tour of their facility. I have one word for those people—resilient. Their building in downtown New Orleans was completely shut down in 2005 following Hurricane Katrina. Right now, they are in a converted mental health clinic which in itself has caused a lot of interesting problems. The current building has been rigged (by the assistant director, Catherine Evans) to accommodate some of the laboratory’s instrumentation. 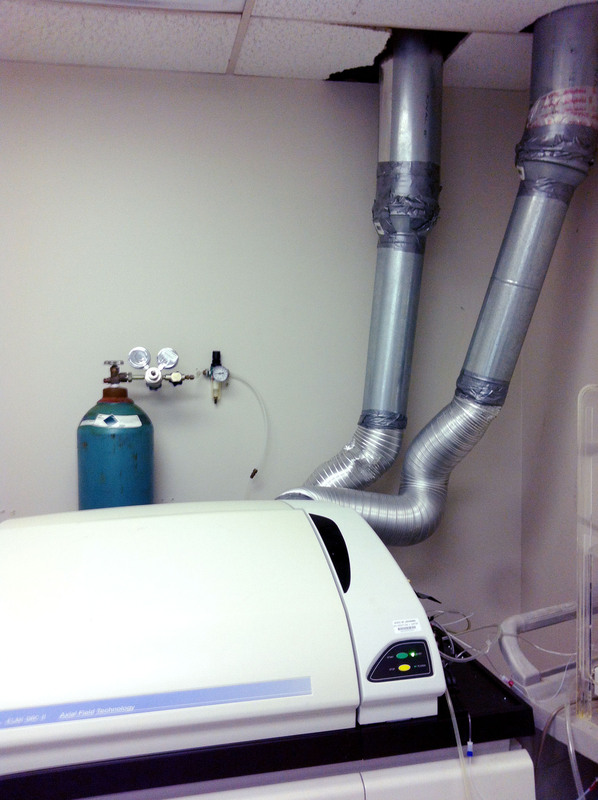 The ventilation system in the photo of the ICM room is some of Catherine’s handy work! Steve Martin, the lab director, says that they have purchased a lot from a local hardware store. At any moment, one of the myriad of air conditioning units is usually down. In the molecular lab, there is no ceiling, thanks to rain damage. When it rains, it actually rains into the room. Often employees have to mop before they can test. The old Louisiana Department of Environmental Quality lab (DEQ; closed down a few years ago) will become the environmental and chemical lab for the public health laboratory; a new building housing the biological testing is being built. The DEQ lab building is not very old, so the facilities there are perfect to house the public health lab equipment and supplies. The location of the new lab is on the Capital grounds so security will be provided by the Capital police. There will be a fence around the entire property. There will be ample space for receipt of specimens, one floor with totally flexible bench space, and an open airy concept to the new building. I used to work at the Louisiana public health lab. As you can imagine, it was bittersweet to see the people I used to work with; we reminisced about the days before and after Katrina. That’s why I can tell you that you would have to see this to believe it! The staff here has withstood such great tribulations and continues to carry on knowing that their mission – protecting the public’s health – is more important than anything! As we talked to Catherine, she told us that the public health lab is still doing post-oil spill testing of the seafood that is coming from the Gulf (BP is paying for that testing). She has a great system set up for screening and has yet to find a positive for PAHs. As we talked about this, she mentioned that she was filmed doing these tests for MSNBC, and Jeff Corwin actually came into her lab with a film crew. At the end of last year, there was an article in the Baton Rouge newspaper, The Advocate, regarding the new lab. Catherine told us that the construction is ahead of schedule (how often do you hear that?) and that they are scheduled to move in March 2013. Another interesting thing – when I was hired to work at the state public health lab in 1994, the lab director at that time (Dr. Henry Bradford) told me that we would be in a new building in about 2 years. Of course, that didn’t happen, but the architectural firm that did the plans for that first iteration of the building is the same one that did the plans for the new building. The head architect on the project, who was a staff architect on the proposed building in 1993, is excited to finally see this project to fruition! Having been housed in the Louisiana State Public Health Lab from 1994 until 2005, I know very well the difficulties we all faced in the original building where asbestos remediation was under way on our floor immediately before Katrina hit. Since then, the lab has faced many challenges including Hurricane Katrina. The people who work in the Louisiana State Public Health Lab are resilient, to say the least. I can’t wait to see their new facility in Baton Rouge! To the dedicated folks at the Louisiana Public Health Lab: Kudos on your dedication and passion to public health. The citizens of Louisiana are lucky to have such a committed team. You make ME proud to work in a public health lab. I understand the bittersweet feelings as you look toward your new lab. I truely hope that as you look toward your future, that you can feel the same excitement and passion about your work.